A while ago, I was given the opportunity to build and Astorath model for a DIY Chapter. The catch was, I had to do it out of plastic. The metal version would be near impossible to convert over. Of course building the same thing from plastic wasn't going to be to easy either. That's the official GW version there on the right. Fortunately for me, I kind of had an idea on how to do it. 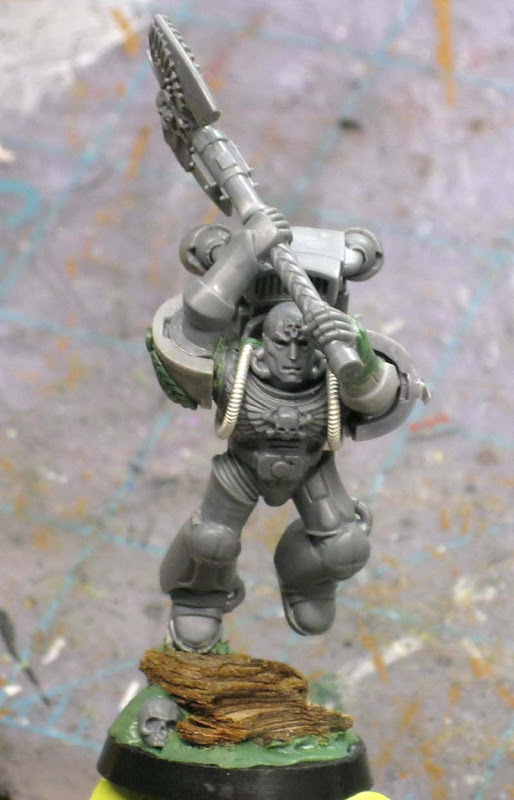 After going through all the Blood Angel bits when they came out, there are a number of pieces in there that I thought could be used to do the same thing. The key was the two-handed power axe weapon thingy. With that as my starting piece, I really only needed to find another (his left) arm and then figure out how to make it all work. Let's start at the bottom with this one and work up since that's the easiest way to go. 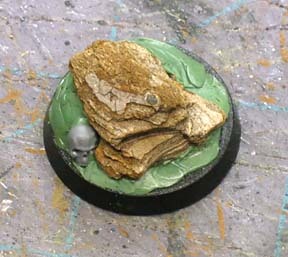 The base is nothing grand, a small piece of bark with some greenstuff to fill in around it. The skull comes from the legs I used on the model. I cut it away so the legs were not so easily recognized as being "that particular pair with the skull on them." I pinned the legs through the piece of bark and into the actual base underneath. This gives it the stability it needs to stand up. 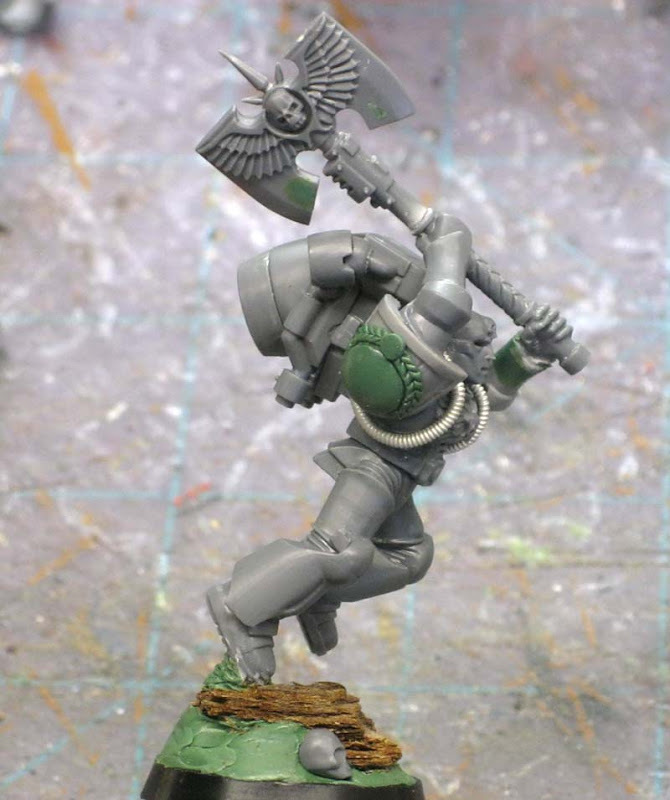 I also set the model back slightly on the base so there was more under him and his mass was centered over the base instead of leaning way out over it. Since he is a Librarian, I had to add some power cables to him. What self respecting Librarian doesn't sport them these days? The cables come from Dragon Forge Design. They made adding the cables pretty easy to do. It takes a bit of fiddling to get them in just the right position and then you have to be careful not to use too much superglue. One thing I did discover was that if you mess with bending them too much, they will actually break. This came just as I was getting the cable in the perfect position too. The lesson is to be careful bending them and do it no more than you have to. You need to have a plan before you start otherwise you end up breaking them and having to start over. Believe me. 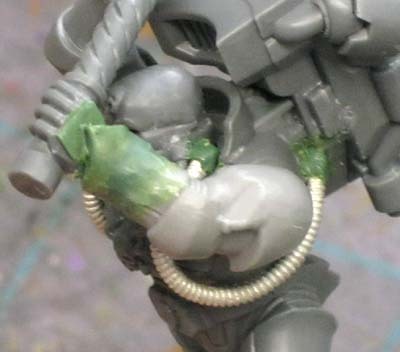 The look is finished off by adding some greenstuff to the end points to simulate the connections into his armour. As far as time goes, these are much quicker than trying to sculpt the cables from greenstuff. Just don't bend them too many times and you'll be fine. 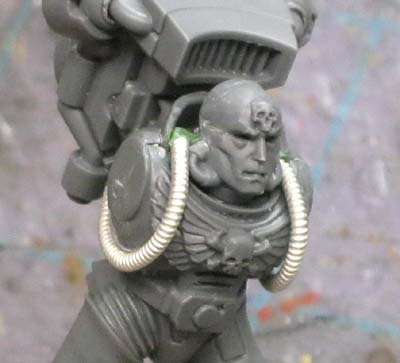 And his head is a Blood Angels head that used to have some kind of ornamental thing around the top similar to an Iron Halo. All that was removed so it matches the previous biker Librarian I did for the same army. The arms were the real challenge to this project. One arm came with the particular weapon bit so I started out half way there. At first I thought one of the arms that holds onto weapons from someone like a biker gunner or a landspeeder gunner might do the trick. Turns out those are a bit too static. I ended up using a left arm form a bolter Marine. I cut the hand off and was able to position it perfectly. 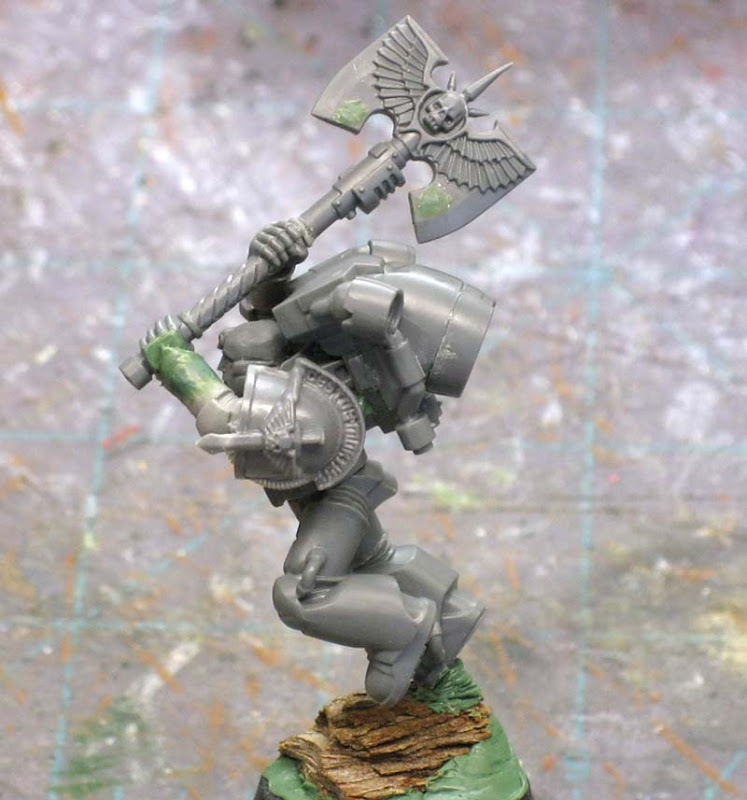 A little bit of greenstuff was needed to mimic the armour on his other arm though. Getting the whole thing in place was tricky. I needed to have enough room for the model's head and have the weapon clear the jump pack behind him too. I ended up cutting the shaft of the weapon just past his upper hand so that I could rotate the blade into a more practical and correct position once I had the arms in place. I managed to get just enough room for his head and clear the jump pack behind him. I thought I was going to have to extend the weapon shaft in order to accommodate the positioning of the blade, but it just fits in there so I escaped having to do that. I did have to go in and greenstuff the small blood drops on the blade of the weapon to hide them. The arms do not match up perfectly with the shoulders on the model. There are small gaps on each side. Nothing that is too crazy, but you'll need to fill the gaps in with a little greenstuff to hide your work. That and his shoulderpads go a long way towards hiding the unsightly joints. And the finished model. You can see how all of it fits together now. The blade is in the right position if he were actually bringing it to bear on an opponent. You can see his right leg has been cleaned up around his thigh too. The original model has some kind of trinket there that goes around his leg and that had to be removed. 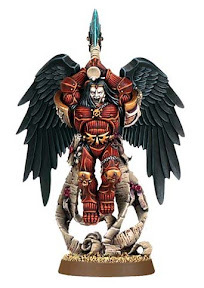 In the end, this guy does not have the wings like Astorath does. It wouldn't be impossible to add them to the model though if you were looking to build your own Astorath for an actual Blood Angels force. If he were not sporting the jump pack, you might be able to get his arms positioned slightly higher and further back giving the weapon a little more heft to it and making it look like it's taking all of his effort to get this thing moving. And a couple more shots of the finished model. All that's left is to paint him up now. The shoulderpads came from my bits box and match the theme of the force. I thought the left shoulderpad with the hanging icon was a nice touch along with the extra flange across the top of it. Makes him stand out. That and his other shoulderpad marks him as being an Officer with the laurel and room for me to add a little freehand in there. Nice conversion! I like the bare-looking head. I'm a bit confused about the model, though. is this a librarian based on Astorath's pose? I ask, because Astorath is a chaplain, not a librarian. Thanks, the model is indeed a Librarian... just the pose is taken from Astorath. Nice! Got the direction of the model just right as well. Quick question- what size pin did you use to keep it in place? Tenzing: He's pinned in place with a small paperclip that fits in the hole made by a standard GW pin drill. The trick with the bark is to coat it with superglue before hand so that it hardens somewhat and will support the weight of the model better.